Holistic Spaces Podcast with Anjie Cho. Welcome to the Holistic Spaces Podcast, where I hope to inspire educate and empower you to create your own holistic spaces that truly nurture and support you. I’m Anjie Cho, a licensed architect, feng shui educator, co-founder of Mindful Design Feng Shui School, and founder of the Holistic Spaces blog and online store selling beautiful and nourishing objects for living. Tune in the second and fourth Mondays of every month for a new podcast episode. 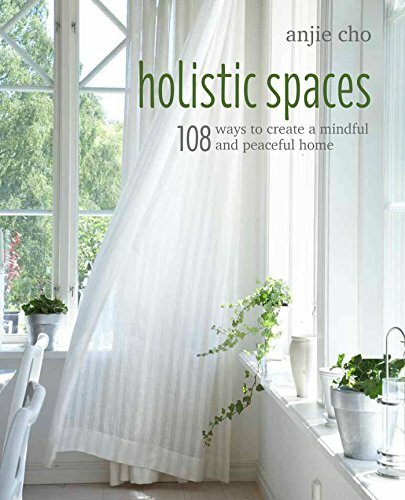 Before we get into this episode, I would like to congratulate the winner of our Holistic Spaces giveaway. The listener named Napping Owl left a lovely and touching review on our iTunes page and has been selected as the winner of a mini consultation! If you are Napping Owl, please email us at info@holisticspaces.com so that we can set up your consultation. We don't have your contact info! This month I'm so happy to have my friend and fellow classmate, Laura Morris, joining us on the podcast! Laura and I completed the BTB Masters Training Program together and have remained good friends. Previously an interior designer and now a certified feng shui consultant, Laura has just released her book, Creating Change: 27 Feng Shui Design Projects to Boost the Energy in Your Home, and she's with us today to share one of these projects and discuss how creativity fits into the practice of feng shui! I'm so excited for Laura's book! Visit creatingchangebook.com or morrisfengshui.com to download an excerpt of the book, including this project, and keep an eye out for where to find the whole book. Of course, if you decide to complete any of the projects, please share with us! Don't forget to sign up for the Holistic Spaces newsletter and receive monthly tips on feng shui, green design and holistic living. Have a question for us? Let us know, and we'll do our best to answer it on the blog as part of our Q&A Sunday series. You can also schedule a 15-minute consultation call for a more personal, in-depth answer! If you haven't been to our Patreon page, check it out! You can support the Holistic Spaces podcast for as little as $1 / month, and it makes such a difference for us! Next month, we'll catch up with my teacher, Barry Gordon, and talk Ghosts, Entities and Feng Shui, just in time for Halloween! Laura Morris is a certified Feng Shui consultant, artist, and designer. Through her articles, workshops, videos, TV appearances and consultations, Laura has guided thousands of people to shift their ch’i and revitalize their living spaces, increasing both energy flow and harmony. She believes that by combining mindfulness, Feng Shui and creativity you can transform both your space and your own personal energy. NEW EPISODES OF THE HOLISTIC SPACES PODCAST WITH ANJIE CHO ARE AVAILABLE THE SECOND AND FOURTH MONDAYS OF EVERY MONTH. DON'T FORGET TO ALSO TUNE IN OCTOBER 1 FOR OUR NEXT EPISODE OF THE ASTROLOGY & FENG SHUI MINI-SERIES! I want to share a new giveaway for the podcast! We're giving away another 15-minute Mini podcast feng shui consultation (to be aired on a podcast), similar to the one in Episode 030: Attracting a Successful Career, a Mini Consultation. Note: You can remain anonymous if you wish! To enter, you must leave a review on iTunes, then follow up with your email to info@holisticspaces.com. Between now and June 30th, everyone who enters will be entered into a raffle for the free podcast consultation! Click HERE to open the Holistic Spaces podcast in iTunes and select "View in iTunes"
Select "Reviews", "Ratings and Reviews" or "Customer Reviews" (depending on your device), and select "Write a Review." Don't forget to select a star rating as well before sending! Find additional help on the Apple support page! Don't forget to email us your review to be entered! This week, my friend, mentor and fellow feng shui practitioner, Katherine Metz, is back to finish up our discussion on the concept of clutter and the five elements. If you didn't catch the first part, check that out here! In the last episode, we talked clutter, the yin and yang theory and how to address clutter if you have a Metal or Water personality type. This week, we're on to the other three elements! Once again, thanks to Katherine Metz for taking the time to share her knowledge and insight around clutter and feng shui! Do Katherine's notes on the five elements match your personality? Weigh in, in the comments! If you have further questions regarding clutter, the five elements or anything else related to feng shui and green design, let us know! You may get an answer on the Q&A Sunday series, or you can opt for a FREE discovery call or 15-minute consultation call. Don't forget to also sign up for our newsletter and get tips on holistic living and feng shui each month! And if you're enjoying the podcast, please drop by iTunes and leave us a review, then let us know, and you'll be entered to win a free 15-minute mini-consultation on the podcast! Tune in next week for a mini consultation on stability! With over 30 years experience, Feng Shui Expert Katherine Metz is your guide and personal Sherlock in an exciting forum—Feng Shui Storyboard. The Storyboard illuminates the mystery of place. We are all profoundly shaped by our environment. It’s imperative that we unfold a better understanding of the working relationship between buildings and people. Only then will our buildings offer the grace required of them. Inspired by 25 years of study with H. H. Grandmaster Professor Lin Yun, Katherine is boldly and creatively infusing new life into an ancient art. You can find more information about Katherine and her services at katherinemetz.com. DON'T FORGET TO ALSO TUNE IN JUNE 5 FOR OUR NEXT EPISODE OF THE ASTROLOGY & FENG SHUI MINI-SERIES! I'm so excited to talk with one of my mentors, Katherine Metz, on clutter, feng shui and the five element philosophy. Clutter is becoming a popular concept in our society, and Katherine has decades of experience with addressing and correcting clutter, keeping feng shui and the five element theory in mind. Thanks so much to Katherine for joining us and offering her wonderful knowledge on clutter and feng shui. Be sure to join us for the second part of this podcast on May 22! If you are a metal or water personality, do you identify with the points, Katherine touched on? We'd love to hear from you! You can also send in feng shui and green design questions and potentially have them answered on our Q&A Sunday series! If you'd like urgent or private answers, check out our 15-minute consultation calls! Don't forget to also sign up for the Holistic Spaces newsletter for once-a-month tips on holistic living and feng shui, and leave us a review on iTunes for a chance to win a mini consultation on the podcast! One of the most important concepts of feng shui is that of yin and yang and balance. I'm honored to have one of my BTB teachers and a student of Grandmaster Lin Yun, Barry Gordon, to share his insight on the yin and yang system, the Tai Chi Symbol and how yin and yang work in our lives and spaces. Thanks so much to Barry for taking the time to explain this basic, but complicated, concept to us! I hope you can better understand why the ideas of yin and yang are so important in feng shui and creating a holistic space! If you have questions about this or any other feng shui or green design aspect, please feel free to reach out! You may even be featured on our Q&A Sunday series! You can also set up a consultation call to have your questions answered on an immediate and personal level. Don't forget to also sign up for our Holistic Spaces newsletter for once-a-month tips on holistic living and feng shui! Barry Gordon got his degree in Physics and then became a Career Naval Diving Officer. During his three tours in Vietnam, he had a Near Death Experience which changed the course of his life. In 1970, he left the Navy and went to live in India for two years, where he lived in an Ashram, meditated extensively, became a vegetarian, learned yoga, tended an elephant, and learned how to heal his PTSD’s. DON'T FORGET TO ALSO TUNE IN MAY 1 FOR OUR NEXT EPISODE OF THE ASTROLOGY & FENG SHUI MINI-SERIES! Happy Spring! Spring is an amazing time for new beginnings, both in the world of feng shui and in life in general, so this week, I thought we would talk about how to welcome spring and new beginnings in our holistic spaces. We have many posts on the Holistic Spaces blog about spring and new beginnings, so be sure to check them out after this! I want to thank each of you for listening to the Holistic Spaces podcast! You are the reason I do this! I would love to hear what new beginnings you are looking forward to this year and how you may use these feng shui adjustments to ensure they go well. If you have specific questions about feng shui, new beginnings, green design or holistic living, send them along or set up a consultation call. Your questions could even be featured on our Q&A Sunday series! And don't forget to also sign up for the Holistic Spaces newsletter for fresh tips every month! Tune in April 24 for the next Holistic Spaces Podcast, Yin and Yang with Barry Gordon. Happy Chinese New Year! While the new year actually began earlier this month, there's still plenty of time to calculate your Nine Star Ki for the upcoming lunar year and see what 2017 has in store for you. Over the last few weeks, we heard from experts on the Chinese Zodiac animals and their energies for the year, but I'm also a huge fan of Nine Star Ki in addition to the animal horoscopes. Listen in for how to calculate your number and what to expect this year! I hope you are all as excited as I am for the new year! What does 2017 have in store for you? Does it match with your expectations? If you have questions about your Nine Star Ki or want to learn more, feel free to send in your questions or schedule a consultation! You could even use our new 15-minute consultation call service for this! Don't forget to sign up for the Holistic Spaces newsletter too, where I share monthly tips on holistic living and feng shui. Tune in March 13 for the next Holistic Spaces Podcast, Feng Shui for the Bathroom. Happy New Year! I hope everyone's 2017 is off to an incredible start. :) We're also preparing for another new year: the Chinese New Year! My friend, feng shui expert and Chinese astrologer, Doris Ingber is back this year to discuss the upcoming Fire Rooster Year and the energy it brings. Tune in for her insightful information around the Rooster and his energy! Once again, Happy New Year to each of you! Thanks so much to Doris for her expertise and time, and to each of my listeners as well. Be sure to drop in for the next podcast on January 23, when Doris returns to share predictions and animal horoscopes for the Year of the Rooster! As always, I encourage you to submit questions to our Q&A Sunday series or reach out directly for a 15-minute consultation call, a new service we offer for more personal answers! If you're interested in tips and insight for green living, sustainable design and feng shui, sign up for our Holistic Spaces newsletter and receive a few each month! Doris was introduced to Chinese metaphysics in 1999 after her 30 year career as a fashion merchandiser. Intrigued by the spirit and science of energy she pursued certifications in Classical Feng Shui, Interior Alignment, 4 Pillars Chinese Astrology and Space Clearing. She consults with architects, interior designers, home and business owners to create environments which enhance the lives of those within. Her work has been featured in The Wall Street Journal, New York Times, The New Yorker and Fortune.com. For more about Doris, visit www.kismetfengshui.com. Be sure to sign up for the Holistic Spaces newsletter for more tips and advice on feng shui, green design and holistic living, around the holidays and all year! You'll receive a 10% off coupon for signing up, just in time to save on holistic gifts! As always, we love to hear from you with comments or questions. You can send them in here and may even be featured in our Q&A Sunday series! Rosalie is a Certified Feng Shui Practitioner, 2002 Graduate and the first graduate to become a full-time faculty member and mentor of the BTB Feng Shui™ Masters Training Program. She has 30+ years of studies in Taoism, energy healing, meditation, astrology; an MBA from NYU Stern; and many years of corporate management experience. Rosalie takes a practical approach to Feng Shui and makes complex concepts easily understandable. Rosalie is a Red Ribbon Professional Member of the International Feng Shui Guild® where she served as Board Chair from 2006 to September 2014 and where the BTB Feng Shui Masters Training Program is a Gold Level Member. For more information or to study with Rosalie, visit btbmastersfengshui.com. We've made it to the last of the five elements on the Holistic Spaces podcast! This week we'll talk about the Fire element, what it represents and how to keep it balanced in your life and spaces. If you're just tuning in, listen in to our previous podcasts on the Earth element, the Metal element, the Water element and the Wood element for tips on balancing each of them as well. The Fire element is related to passion and recognition, so if it's balanced, you'll feel a healthy enthusiasm for life and in your relationships with others. Who doesn't want that? So let's talk balancing the Fire element! Where does the Fire element fall in your life? Do you have too little? Too much? Just enough? If you feel you need a little more harmony in your Fire element, try a few of these suggestions, and be sure to check in on the blog for the My Favorite Things post on adding fire to your space. You can also check out each of the other elements' corresponding posts as well! As always, I encourage you to subscribe to the Holistic Spaces newsletter for monthly tips on feng shui, green design and holistic living. You'll get a free 10% coupon to the Holistic Spaces store when you sign up! If you have questions about feng shui or green design, send them my way and you could be featured on our Q&A Sunday series or a future podcast! Sign up with your email address to receive news and updates as well as a 10% off coupon! Nov 23, 2015 Episode 007: Feng Shui for the Holidays! Aug 18, 2015 COMING SOON! I’m here with my teacher Marcia 💗 If your interested she’s teaching in December in nyc! #Repost @shambhalanyc ・・・ Just Announced! One of our most anticipated programs of the year is back. Kado: The Path of Flowers, will be taught by the brilliant Marcia Wang Shibata, November 30th - December 2nd at Shambhala New York. Beginners welcome! Come learn to create beautiful flower arrangements and experience Kado as a creative and meditative dance with nature, space, and perception. Like meditation, Kado teaches us to really look at and work with what is before us. Space is limited. Please register early at shambhala.nyc. feng shui cures, products, podcast, mandalas, blog and more! Space clearing, Feng shui crystal balls, Chinese new year charms, natural crystals, and more. The founder, Anjie Cho is an architect and feng shui consultant. She designs beautiful interiors in New York City and Los Angeles.